Bloom from Opal Limited is what you get when you combine beautiful music visualization, a composition tool that requires no training, and world famous ambient musician Brian Eno. My Generation: Bloom’s minimalist look—colored circles that float and fade—complement the ambient sounds and generative music it produces. Touch the screen to generate different ambient sounds, which then begin to play in a loop. If you stop touching the screen, Bloom begins to create “generative music”—a term coined by Eno for music that’s ever-changing and created by a system—that slowly morphs and changes as the app plays itself. Bloom has a minimalist look and feel, which complements the sounds it creates perfectly. 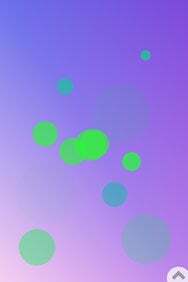 When you touch the screen, colored circles appear, floating around and fading away as the music changes. You can shake the iPhone or iPod touch to clear what’s playing and start over, or you can just let it run on its own. Bloom is gorgeous visually, but also works great when you let it play in the background while you work. Bloom is compatible with any iPhone or iPod touch running the iPhone 2.x software update.